Noël Carroll is a philosopher of aesthetics, known for his work on the philosophy of film and in particular, horror film. A former student of George Dickie, Carroll is intellectually connected to British aesthetics, a tradition that historically has been skeptical of the “grand theory” tradition in the humanities in which I was trained (e.g., deconstruction, feminism, Marxism, semiotics, hermeneutics, reader response, psychoanalysis, etc.). As such, I am somewhat at odds with Carroll intellectually. Nonetheless, Carroll is an incredibly insightful philosopher and an outstanding writer. He expresses his positions with impressive clarity and he offers thoughtful and rigorous arguments in support of them. His analyses of film are truly illuminating, and he has made me rethink a lot of my own positions on certain “trashy” film genres, such as horror, indirectly helping me think about science fiction in productive new ways. Like most analytic philosophers, he is very good at critically summarizing the complex aesthetic arguments of others and critiquing them step-by-step, and while I don’t always agree with his conclusions, I always feel like I have benefitted from the reading. In short, Carroll challenges me, one of those authors who forces me to distinguish between good philosophy that I disagree with and bad philosophy. (Indeed, I would argue that peer reviewing for especially third wave HCI needs to be much more careful about this issue than it presently is, because as the work becomes more expert-subjective the likelihood of intellectual accord decreases, and we risk creating a circular firing squad for ourselves if we can’t handle intellectual disagreement more constructively.) Anyway, for these reasons, I have become a fan of Carroll’s work. In a bookstore in Taiwan in 2011 (my somewhat depressingly–thanks Borders!–go-to place for brick and mortar academic book shopping), I came across his On Criticism , in which he offers his own view of criticism, written as a short introduction to the practice. I have many issues with the book. One of Carroll’s central contentions is that the primary goal of interpretation in the arts is to understand the intentions of the artists behind the works, a position he advocates at length (and ultimately unpersuasively). He also casually dismisses the epistemological complexities of the hermeneutic circle (which I’ve blogged about here). And above all, though he insists that criticism plays a social role, he does not engage in the politics (or other potential negative effects) of that social role: what it means that a specially trained expert is (de-)legitimating certain artworks, instructing audiences how to understand artworks, and in doing so potentially contributing to hegemonic social practices. Yet in spite of my criticisms, this is an outstanding book, and I’d like to summarize some of its major points here for my readers. Art criticism is the verbal act of criticizing artworks. Yet what marks such criticizing off from other forms of discourse, notably other forms of discourse about artworks? It is the argument of this book that the distinguishing feature of the pertinent form of criticism is evaluation. Of course, criticism, properly so called, is not merely a matter of evaluating an artwork–of giving it a thumbs-up or a thumbs-down. Critics are expected to supply reasons–indeed, good reasons–in support of their evaluations. Criticism comprises many activities, including: the description, classification, contextualization, elucidation, interpretation, and analysis of the artworks on the docket. But in addition to these procedures criticism also involves reasoned evaluation…. Now, I believe that design inherently involves critique–that is, that every design manifests a critique of some part of everyday life, which it intervenes in to change–and therefore I believe that there are non-verbal forms of criticism. I also am a little uncomfortable with the primary notion of criticism to be evaluation, depending on how the word is meant to be defined (and Carroll uncharacteristically doesn’t really define the word in this section). It seems to me that much of criticism is about understanding and explanation, and that while these can never be extricated from evaluation, they can (in my view) trump it in certain instances. But this is a tangent. Earlier I criticized Carroll for painting an overly positive picture of criticism, but he can arguably be defended at least for counterbalancing the everyday understanding of criticism as negative and destructive. Carroll is especially effective at showing the positive social, intellectual, and aesthetic benefits of criticism. What I want to do for the rest of this post is briefly summarize what Carroll has to say about each of the “activities” of criticism: description, classification, contextualization, elucidation, interpretation, and analysis. It is important to note that for Carroll, each of these is conceptually distinct from the others, even if in practice they may overlap and/or be inseparable from one another. Below, I summarize Carroll’s account of each of these activities, and I hope readers find them useful, either to help them improve their critical practices or as reviewers to better perceive critical rigor (or its lack) in HCI works that seek to offer a critical contribution. Description. Carroll’s definition is as follows: “Description is a matter of telling one’s readers or listeners something about what the work of art at hand is like. It gives the reader something concrete to hold onto cognitively.” (86). It seems to me that Carroll’s use of “description” refers to a more or less objective account of the work, that is, the sort of thing that just about any appropriate prepared person would agree is part of the work, e.g., the main outlines of a plot, the colors of painted areas, and the height and general shape of buildings. The primary logical and rhetorical purpose of description is “to ground the other operations of criticism” (89). Carroll summarizes, “Perhaps the most important service that description performs is to segregate out for attention the parts and relations of the work that the critical analysis or interpretation goes on most often typically to demonstrate as belonging to a functionally organized whole worthy of evaluative commendation for its artistic achievement of unity” (92-3). As I read it, for Carroll description is an intrinsic category, that is, it describes the work itself. I also would emphasize his point that it is editorial, in the sense that description calls attention to some parts of a work at the expense of others. Classification. 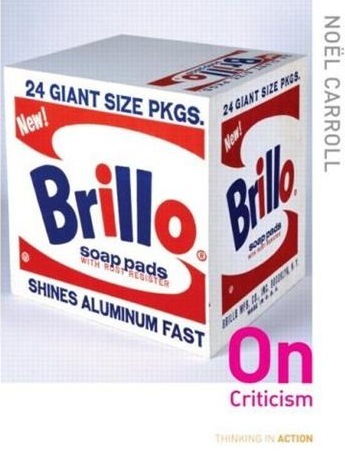 Carroll: “Fundamental to the task of criticism is placing the artwork at hand in its proper category (or categories), because once we know the category (or categories) to which the artwork belongs, we have a sense of the kind of expectations that it is appropriate to bring to the work” (93-4). Categories not only include broad art forms–photography, painting, novel, architecture–but also styles, genres, movements, oeuvres, and so on. “Among the major services that the critic performs for her public is to inform us about the categories to which artworks belong. That is a leading aspect of the critic’s expertise; she is an expert concerning the categories of art, or, at least the categories pertinent to her beat. If she is a contemporary critic, she stays on top of the emerging genres, movements, and styles. But also, she has command of the history of her artform and the categories that have flourished in the past. In general, the critic will have a larger repertoire of categories of art in her cognitive stock than plain readers” (96-7). Contextualization. Carroll characterizes contextualization as “external description, by which I mean the description of the circumstances–art historical, institutional, and/or more broadly socio-cultural–in which an artwork has been produced” (102). Carroll observes that critics often use contextualization to help an audience appreciate why a given aesthetic innovation was innovative, why at that time this sort of expression or style (etc.) was difficult and why its achievement brought value to the (art-)world. Contextualizing “the artwork is a recurring feature of criticism just because it provides a way for the critic to clarify the purpose of the work by situating it in contexts–art historical, institutional, and more broadly social–in which the logic of the choices that confront the artist is illuminated, thereby guiding the description of the work in terms of the manner in which the work has been articulated in order to answer the perceived demands of the presiding circumstances” (107-8). It seems to me that description and contextualization are opposite sides of the same bridge, which spans the gap between the meanings expressed by an artwork and the significance of that same artwork in the world, or, in more technical vocabulary, between “the text itself” and aesthetic experience. Elucidation. Carroll has a very specific usage of this term in mind, which is narrower than our everday usage of the term, and in particular, he sees it in conceptual opposition to interpretation. “By elucidation I have in mind the critical operation of identifying the literal meaning, narrowly construed, of the symbols in the artwork… Elucidation, in my sense, is concerned with determining the correlation between fixed conventional and iconic symbols and what they symbolize” (108-9). An example of elucidation is noting that the presence of a lamb in the stained glass window of a medieval church symbolizes Christ, the “lamb of God.” A critic needs only know the appropriate conventions to understand this symbol; no special interpretative effort is otherwise needed for elucidation. Elucidation also seems to me to be focused on a work’s individual parts (e.g., this or that sign or symbol), rather than the work as a whole. Critics use elucidation when they believe that an audience simply may lack knowledge of relevant codes or conventions to make appropriate sense of the work. Interpretation. For Carroll, interpretation does require much more sensemaking work than elucidation: “Interpretation, on the other hand, goes beyond the given in order to establish the significance of what has been given. Interpretation is concerned with significance–for instance the thematic significance or the narrative significance of an artwork or the significance of the behavior or a character in a fiction or the interrogation of the import of a metaphor, whether local or global. Typically, interpretation involves … hypothesizing from the various parts of an artwork to the theme or message or idea or concept that best explains why the assemblage of parts before us coheres together as a whole, i.e., what theme, or message, unifies them…. [I]nterpretation … involves discovering the meaning … of the actions (or inactions) of characters, notably where those actions appear incoherent, enigmatic, or opaque…. [I]nterpretation scrutinizes not only the meaning (or significance) of the character’s modes of behaving, but also the meaning of the action or actions the artist undertook in the creation of the work…. ‘Why is it there?’ The goal of interpretation is to relieve that perplexity” (110, 114-15, 119). Interpretation is an original and creative activity of building a single overarching understanding of the interrelationships among a work’s diverse parts and whole, however each of these is defined. Analysis. Carroll: “Analysis is the label that I reserve for the broad class of critical operations–of which interpretation is a leading, but not the only, example–devoted to explaining the ways in which artworks work” (127). Note that for Carroll interpretation is a form of analysis–i.e., an explication of how various parts add up to a unified whole–but there are other forms of analysis that are not interpretation. Carroll uses the example of an Amish checkerboard quilt, which lacks the semantic density of a novel or film, thus placing it “beneath interpretation”; “Nevertheless, although it does not make sense to interpret such a work, the critic may still analyze it–explaining how the color, texture, and pattern of the work invite, engage, and delight the eye, promoting perhaps a soothing and restful atmosphere” (127). I provide here a few more quotes, because analysis (whether interpretative, elucidatory, demonstrative, or otherwise) seems to be the heart and soul of critical activity. “Critical analysis supports an evaluation of an artwork by showing how the artist’s choices regarding the constituents that comprise the work enable the artwork to achieve its goals successfully (or by explaining why these choices have failed to do so)…. [T]he overall direction of analysis is usually holistic, dedicated to establishing the unity of intent, thought, or design in the artwork…. This tendency stems from the two central functions of analysis: to promote the audience’s understanding and appreciation of the artwork and to ground an evaluation of the work” (131-2). So to reiterate the purpose of this blog post, I wanted to summarize (and extensively quote) Carroll’s theory of criticism because I think many in the HCI community will benefit from such a précis. Other than where explicitly noted, I have aimed more to represent Carroll’s position than to offer my own, so I do not necessarily endorse everything I have quoted here as my own position. Nonetheless, his explication of the six activities of criticism struck me as unusually clear and constructive, and the benefits of sharing his theory of criticism (or “metacriticism” as he calls it in his introduction) outweighed any intellectual objections to some of his positions. If you find this blog post useful, and especially if you use it your academic work, please cite it. Knowing I have a readership, and being able to demonstrate it for my own annual evaluations, helps me keep this blog active. Citations can also help non-traditional forms of publication, such as blog posts like this one that are not hidden behind pay-walls, flourish and gain legitimacy. Carroll, N. (2009). On Criticism. New York: Routledge.